The gunwinches we deliver are of different sizes. The winches are made compact and light weight. The winches can be designed for different types of sliprings and airswivles. 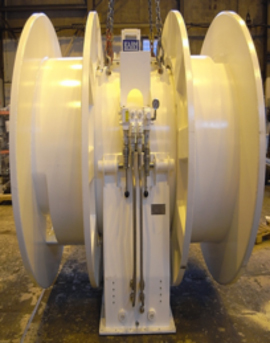 We deliver the winches in a single or a double drum configuration. The foundation is made for easy installation and easy maintenance. The winches can be delivered with tension monitor system. We deliver gun cable spooling system for spooling on the gun-deck. This is a transverse spooler system. The system can be both manual control on a remote or automatic control. The handling system for gun float increase the safety and efficiency of handling the gun array system. The system is operated by remote control. It increases the speed of handling the float and reduce the wear on the components. High pressure air control manifold integrates the needed valves and pressure transmitters. The unit is compact and easy to do maintenance of valve components. The manifold design reduce risk for leakage compared to a pipe made panel system.